In the late 1970s a young fire instructor working with a group of students attending recruit training was blown out of a building by a backdraft while engaged in live fire training. It is likely that you never heard of this incident. However, it had a major impact on my life as I was that instructor. Neither the instructor-in-charge, other instructors, nor students recognized the clearly visible indicators of a ventilation controlled fire and potential for backdraft that were visible from the exterior. No one involved in this training exercise anticipated the impact of horizontal ventilation on fire behavior during this trainig exercise. This incident ignited my passion for understanding fire dynamics, reading the fire, and predicting likely fire behavior. No fireman can ever be considered to have attained a real proficiency in his business until he has thoroughly mastered this combination of theory and practice. This concept so clearly articulated by Massey Shaw, is at the center of my professional mission. As a fire officer and educator, I am focused on improving understanding of practical fire dynamics and its application to tactical firefighting operations. Not just what and how, but why! This mission has a major influence on my work as a chief officer and as the owner of CFBT-US, LLC. I presently serve as Fire Chief with Central Whidbey Island Fire & Rescue in Washington. Prevously I served as Training, Safety, & EMS Division Chief with Gresham Fire & Emergency Services (GFES), in Gresham, Oregon. GFES had a comprehensive compartment fire behavior training (CFBT) program that began in the probationary firefighter academy and continues with ongoing in-service training. The International Association of Fire Chiefs (IAFC) recognized Gresham Fire and Emergency Services compartment fire behavior training (CFBT) program with an Award of Merit at its 2006 Annual Conference. June 30, 2009 my position was eliminated due a major reduction in the department budget. In 2002 I watched Under Fire a Discovery Channel special on firefighting in Sweden, narrated by John Taylor from the Greater Manchester, UK Fire Brigade. Intrigued, I did a bit of research and through a circuitous process made contact with John and arranged a trip to attend a Fire Behavior Instructor course at the Uppsala Fire Brigade in Sweden. Along the way I became friends with Paul Grimwood (London Fire Brigade, ret.) and Shan Raffel (Queensland Australia Fire Rescue). 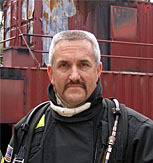 In 2004, Paul asked me to be part of a multi-national team to write a book about the concept of 3D Firefighting and CFBT. Over a two-year period, Paul, Shan, John McDonough, and myself worked to bridge the gap of our common language and author 3D Firefighting: Training, Techniques, and Tactics . I established CFBT-US, LLC in 2006 to provide fire behavior training and related consulting services on an international basis. Working with colleagues from around the world, I have had the opportunity to provide seminar presentations and training in Australia, Malaysia, Germany, Croatia, England, Canada, Chile, and Sweden as well as throughout the United States. I am also a frequent contributor to fire service publications and serve as a member of the Editorial Board of Fire-Rescue magazine. I also had the opportunity to contribute to the development of the fire behavior chapters in the International Fire Service Training Association (IFSTA) Essentials of Firefighting (5th ed.) and Fireground Support Operations (2nd ed). I attended my first fire at six weeks of age (not that I had any say in the matter). Over the last 35 years I have had the opportunity to work in diverse settings as a firefighter, fire officer, and educator. I have served as a firefighter, company officer, and chief officer with several municipal fire departments in Massachusetts, Pennsylvania, and Oregon. In addition, I worked as an instructor with the Massachusetts Firefighting Academy, as a Training Specialist with the National Fire Academy in Emmitsbug, Maryland. I hold Member grade in the Institution of Fire Engineers (MIFireE) and have been granted Chief Fire Officer (CFO) Designation by the Commission on Professional Credentialling. My academic background is as diverse as my career. I obtained an AS in Fire Protection and Safety Technology in 1979 from Middlesex Community College and then began the long quest to complete my bachelors degree. I graduated with my BS in Fire Services Administration from Eastern Oregon University in 2001. Attending the Portland State University Graduate School of Education, I was awarded a MS in Postsecondary, Adult, and Continuing Education in 2003 and I am currently a doctoral candidate (EdD) in Educational Leadership. My doctoral research is focused on how firefighters beliefs about knowledge and learning influence experiential learning (about fire behavior).